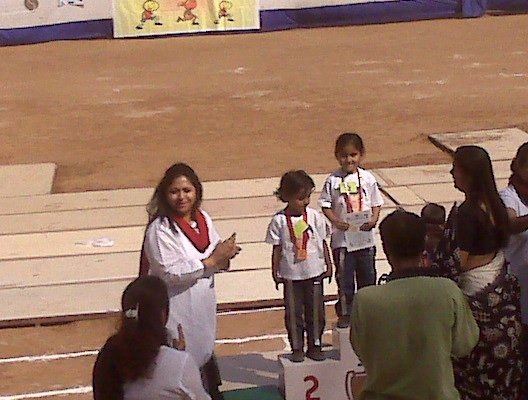 Today I attended my daughter’s school sports day. This was one of the most beautiful moments, to see my 4 years old cute princess standing on the tracks and competing with her classmates. They had to run a while then pick up a football and then hop from there to the ending line and sit on a chair. Hiya (My daughter) ran to pick up the football. I was shouting, clapping and was completely out of my world. Then she was the first to pickup the ball and then she started hopping. She reached the ending line first. Then she looked back to see where are others. In the mean time one of her friends reached the end line and sat on the chair. Then Hiya realized/remembered that she has to sit on chair. So she sat and she won the second prize. I was so happy and excited to see her win a medal. Then it continued with other group of children. I heard an announcement requesting parents to cheer and clap for their kids. They repeated the announcement several times. It was bit surprising for me because I thought clapping and cheering for kids is a natural parent behavior.Then I observed parents and their reactions while their kids are participating. Most of the parents are busy taking the pictures and videos using their cell phone camera or digital camera. They are trying to see their child’s performance through that small cell phone screen. I could understand that the purpose is to relive this moment again and again. So, for them reliving the moment is more important for them than enjoying the moment. That was not the case earlier. My parents used to clap, cheer and jump with happiness when I used to perform. Later they used to demonstrate or enact in front of others with excitement and lots of animations. They used to exaggerate it too. There used to be a spark in their eyes while explaining others. I used to love that. That was the way they were reliving that moment. I still feel that was more exciting than just watching a recorded video. What a memory can create, reality can never create the same. What a book can do that a movie can never do. What your eyes can record that cameras (Cell Phone) can never. Life is a combination of many moments. If you lose the moments then you are have nothing left in your life. Why I am talking specifically about cell phone camera is because it gives an easy access and has the capacity to change your natural behavior easily. So this may sound as if I am advocating against video recording or take to photographs. Not really, I am advocating for living/enjoying the moment. Now whatever comes in its way is not good and if you can record and take snaps without sacrificing the moment then that is the proper utilization of the tool.